In conversation with William Kristol, founder and former editor-at-large of The Weekly Standard. 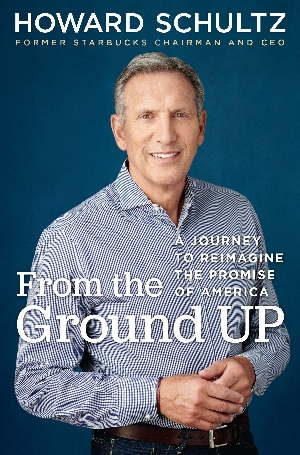 The former chairman and CEO of Starbucks, Howard Schultz led the java giant from eleven cafes in the Seattle area to more than 28,000 locations worldwide and ranked fifth on Fortune’s 2018 list of “World’s Most Admired Companies.” He is the author of several books, including Pour Your Heart Into It: How Starbucks Built a Company One Cup at a Time; the former owner of the Seattle SuperSonics; and, with his wife Sheri, the founder of the Schultz Family Foundation, which supports national initiatives focused on employment and the needs of veterans. Part memoir and part manifesto of corporate social responsibility, From the Ground Up interweaves Schultz’s inspiring trajectory from a Brooklyn housing project to leading one of the world’s most iconic companies.